The Ardennes Adventure is a 9 day action packed trip to Belgium for Explorers and Scouts (13+) from West Lancs Scouts. 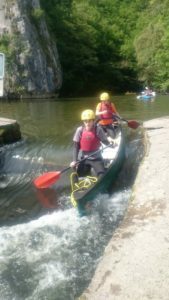 Participants get to develop their skills in Climbing, Canoeing, Caving and Mountain Biking, taking each activity to the next level. It takes place during the spring bank holiday week, setting off from West Lancs early evening on Friday 24th May, travelling through the night we arrive in Mont-Godinne in time for breakfast. At the end of the week we set off early morning on Sunday 2nd June, arriving back in Lancashire in the evening. The event takes place in the Ardennes region of Southern Belgium, midway between Brussels and Luxembourg. We base ourselves in the pretty village of Mont-Godinne in a property that belongs to the Belgian Catholic Scouting Association. Camping in tents we also have use of indoor toilets, showers and communal areas. Rock Climbing – On day one learn how to rock climb, including advanced climbing techniques. 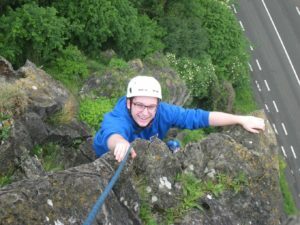 You will also learn how to belay effectively and safely including lead belaying ready for day 2. On the second day, we advance onto multi-pitch climbing, probably one of the very few chances you get to multi-pitch in scouting. 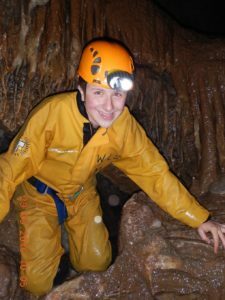 Caving – Go down 2 different types of caves. On day one you get to enjoy the thrill of a flowing stream in an active cave with plenty of water. On day 2 you put on the cave harnesses and climb ladders, ropes and scramble in a vertical cave. The caves are a couple of the best in Belgium. Canoeing – Always a highlight of the trip is the 2-day canoe expedition. Day 1 you get to tackle rapids and white water in Canadian Canoes. Day 2 is more about touring and taking in the sights along the valley while in sea kayaks. With a stay, overnight in our expedition campsite you really do feel like you’ve been on a canoeing adventure. Mountain Biking – For those of you who like the 2 wheeled thrills then cycling is for you. Get off the beating track and take in forest tracks, bridleways and the odd downhill stretch you’ll have a great time cycling around the beautiful Ardennes region. You get to choose, which 3 activities you would like to take part in at the end of the training weekend after you have had a chance to sample them all. Mid-week, to break up the adventurous activities it’s time for the cultural day. It provides time for you to rest a little before taking part in the final adventurous phase. What we do on that day is up to the group but has ranged from trips to local towns, a visit to Bastoigne War museum or even going to Tyne Cot. The choice is yours! To introduce you to each of the activities and so you can decide the 3 you want to take part in while in Belgium, we hold a pre-event training weekend. This is taking place over the weekend of 29th – 31st March 2019 based out of a local(ish) Scout campsite. As well as trying the activities it is a great time to get to know the other participants and the leadership team. It’s a camping weekend based on a self-catering basis, with all fees included in the overall expedition cost (excluding food). The weekend will also include a parents/participant’s presentation on the Friday evening so we can answer any questions you might have. Although not essential that all participants attend it is highly recommended. Participants will be self-sufficient as regards camping (personal gear, tents, stoves, etc). A continental breakfast will be provided each day to enable activities to get off to prompt start. Lunch and dinner will be up to you to plan, buy and cook. The leaders will help you with menu suggestions and give you advice on the cooking if you’re not sure about anything. The cost of lunches and dinners should be incorporated into your spending money (approx £7 per day). The cost of the camp is £395, this includes travel to and from Mont-Godinne in Belgium, internal transport to/from the activities, eight nights’ camp fees and breakfasts at the Mont-Godinne Scout Centre, all specialist activity equipment and instructors/leaders, travel and activity insurance through the Scout Association, a souvenir event polo shirt and an international necker. It also includes the pre-event training weekend. Not included are lunches and evening meals, which are on a self-catered basis, rest day trip out, spending monies and food on the pre-event training weekend.